The very idea of a portable version of Animal Crossing filled this reviewer with glee when he first read about it back in the days of magazines and routers without wi-fi as standard. 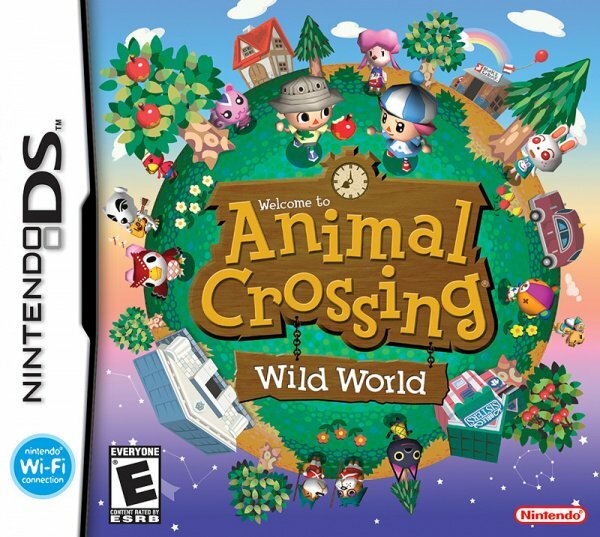 Animal Crossing: Wild World has always been a very special game to fans as it expanded upon the original GameCube title (for this region at least) but somehow managed to condense everything down onto a system you could fit in your pocket. Long car journeys went by in an instant as you scoured the land for fruit and shells to sell, and all-around a good time was had; yet the reasoning why Nintendo decided to release it on the Wii U is a mystery. The basic premise is just like every Animal Crossing game to date: you live in a town and watch it grow. For those who have had no contact with the series it's best described as a life simulator with no real end; you can just keep playing and enjoying the world you've helped mould indefinitely. You can fish and catch bugs to display in the museum, create clothing patterns to maintain your funky-fresh persona, chat to the locals about everything and anything, and most importantly design and expand your home with furniture and decorations. It's a very relaxed experience and one that has stood the test of time over many generations of hardware. As for this Wii U version, it's not exactly what we fell in love with all those years ago. Far from being the first DS game on Nintendo's latest home console, Animal Crossing: Wild World sticks out for numerous reasons. Considering all of the action takes place on the touch screen there's little reason to even have the TV on, with the better option being to simply use the GamePad. Frankly, having the top screen displayed at all feels completely superfluous nine times out of ten. The controls are unnecessarily complex compared to today's offerings, with touch screen controls and physical controls behaving as two different methods entirely rather than working together. It's a bit clunky but this was made during the earlier years of touch-screen functionality, so it's easily forgiven. The visuals have aged rather poorly, as is to be expected from a DS game that uses full 3D graphics. It's certainly not a deal breaker but other elements where the game has aged could well be. Given how far the series has evolved over the years Wild World feels distinctly empty and shallow, with only a handful of the creative things offered in later games. The core gameplay is still solid but areas such as Main Street and Tortimer Island being omitted are incredibly noticeable. Another glaring omission is what brought this title into the modern age above its predecessor: online multiplayer. The entire online multiplayer functionality has been left in the game but simply doesn't work, which is unsurprising but hugely disappointing. Given how the game rewarded you and encourages you to visit other towns and have friends come and see your creations, not being able to do so is a huge blow. It's not something that should be expected in a Virtual Console release but nevertheless leaves a significant hole in the game. Whilst most Virtual Console offerings are unique and worthwhile games in their own right, this simply feels little more than Animal Crossing: New Leaf but with half the content. Animal Crossing: Wild World is unfortunately little more than a watered-down version of the more recent entries in the series. As innovative and technically incredible as it was for its time it has no stand-out features over its younger siblings, and the appeal of its portability is completely lost on the Wii U. New Leaf and Let's Go to the City/City Folk are vastly improved versions of what is in essence the same game, and it's difficult to recommend this version when more recent efforts offer so much more. It's still an enjoyable game but if you've played the Wii or 3DS titles, you've already all but played this one. It took me a while to warm up to this game. I originally bought it on release day expecting it to play almost exactly like GameCube version. The scrolling world and the lack of NES games was a bummer, but eventually the game's charms won me over. Ironically, it was this game that originally brought me to the NintendoLife website the first time around all those years ago. great review! i have the game on my 3DS, and might get it on my Wii U when it ever comes to NA. Not surprised by the score. While all ACs are good games, the lack of internet functionality in this one really lets it down in comparison to those that came after it. It really makes you feel 'shut off'; super hard to go from NL or CF (hell, even the original) to this. The hardware limit in this has a large impact on it as well. As @darknyht said about the lack of NES games, the lower processing power of the DS meant that quite a few other things were left out as well. I absolutely loved this game, as well as Let's Go To The City, as a kid and played it together with a friend all the time. With New Leaf out however, I don't really see a reason to come back to it. This is the game where I really became a fan of this series. It's too bad about the lack of internet connectivity though. That is actually what prevents me from going back and playing it today because I can't bare to not be able to fulfill my Villagers requests to welcome people from out of town. Oh dear. Well, for me these DS games mostly play rather well on the big screen (this for me does anyway). My main gripe is that I go to play it at unsuitable hours when places are closed, but up until Xenoblade it was basically my secondary game after Splatoon. It's definitely valid to dock it points for the Wii U experience of it as opposed to having it on the 3DS, but that platform can play the original anyway and I really like getting DS games on my Wii U, whether they are better to look at on the gamepad or not. It does annoy me that incant chose to have either screen show up big on my TV though. All in all, from just 20 hours of play I'd settle my score down at an 8. If this comes to Wii u, it'll b the only ac. That is sad, considering what a great game it is. I'll definitely pick it up. I can't understand why they bothered to emulate this for the Wii U when they should have just sold City Folk/Let's Go To The City, which is essentially the same game via the eShop but optimised for a home console. No emulation necessary and they can charge twice as much. It's a no brainer, but it seems that even the eShop staff is low on lobotomised staff. I can understand selling these kinds of games via the 3DS eShop (and even so, it would be outclassed and rendered entirely obsolete by the far superior New Leaf). 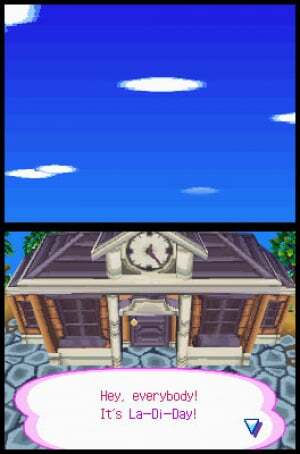 I fail to see how "nostalgia" is of any appeal in the Animal Crossing series when each entry is simply a new and improved version of the last. I don't see the appeal in playing a lesser game after enjoying more recent entries in the series. Even the Wii version is difficult to go back to after having played New Leaf. The only benefit of this is that it is a low-cost entry point for newcomers to the series. Animal Crossing is one of those series where the previous game becomes obsolete every time a new one comes out. I still have my original copy of Wild World, but there's no reason to play it when I can do everything and more in New Leaf. The VC is the one thing Nintendo can't help but screw up. First we get the terrible SNES versions of FF games instead of their superior Advance remakes, then we get the terrible GBA remake of Yoshi's Island instead of the superior original, and now we're getting one of the weakest AC games instead of City Folk, which is still the best entry, period. It's like Nintendo does amazing things with the brunt of their console, then turns around and goes out of their way to make bad decisions on the VC. Man I played this game a lot. When I go back to it now after playing tons of New Leaf it just looks real weird though! Not Bad. Not Good. So what is it? Animal Crossing Wild World, on the actual DS and not Wii U VC, is much better than City Folk, which failed to improve anything from the previous games. New Leaf actually improved things from the previous games. If you plan on going to other towns, you're better off getting the game on the DS. If Nintendo brings back old games that had online content to the VC, they should reactivate the Nintendo WFC for that game. Period. You'd be better off buying a used copy of the Wii port. Even with the stupid "animal tracks" system that destroyed your town's ecosystem, it was an improvement, albeit slight. Probably costs less than this too. "and the appeal of its portability is completely lost on the Wii U"
Finally the stupidity of releasing portable games on the Wii U Virtual Console is starting to come back to bite Ninty's own backside. Of all the Animal Crossing games I played (aside from amiibo Festival, which I haven't played), I did not like this one at all. Whereas the other mainstream games had charm and improvements to their own, Wild World felt like a beta release, lacking virtually any improvements over the original Game Cube game (aside from portability). As a result, it felt more than downgraded and barebones all around. City Folk, in my opinion, at least had a city, the players having their own houses, and had reasonably-priced mortgages. New Leaf was virtually an entirely new experience and full of much-needed improvements. After playing Wild World for a while, I felt ripped off in that there's nothing else to do, and I had immediately gone back to the Game Cube game after that very second. The only things I'll give this game credit for are being the first game in the series to include online play (which is already defunct), introducing options of character customization, lack of grass erosion (I honestly have no idea why Nintendo implemented this in the later releases), and Bottled Messages (no idea why this isn't in New Leaf). Other than that, the watering feature for the flowers is so tedious and pointless, the Top Screen showing the sky (even for Balloon Presents and just looking at your Constellations) is unneccessary, the Touch Screen could've been implemented so much better (other than tapping on a neighbor to say "Hi" to them, the Touch Screen should've been like how New Leaf was), and the lack of a basement is very saddening. I have never felt so disappointed in a Nintendo game and I would gladly take it back to the nearest GameStop to get a bit of money back. Portability does not save this game for me and for now, I'll look at New Leaf as the true first portable Animal Crossing game. When I was younger, Wild World was quite a great game on its own until the subsequent entries have been released, especially with New Leaf. I still own it, but haven't played it in a very long while, simply because I feel it hasn't aged well at all and it gets worse in the future. The technology wasn't there at the time of release and the franchise would continually expands from there. It's not like Mario Kart, where the physics differ from one entry to another and their replayability is high, which makes these games worth playing even after the later releases came. Wild World doesn't have these advantages and was released early in DS lifespan, which hasn't already properly harnessed the power of the aged handheld. They barely managed to cram the game in a 32MB game card, which may explain on how shallow the content really is. Crazy, I know! Another problem with the game is their localization decision to not have any real holiday as the rest of the franchise did, so they can rush the localization process as fast as possible before Christmas comes in. Part of the Animal Crossing appeal is lost on this one because of that. Who would get Wild World over the objectively superior New Leaf? Probably anyone with rose-tinted glasses, but most the gamers would be much less inclined to get the older installment. Let's not forget how phenomenal this game was when it first came out. It had practically all the content of the Wii package, on the go. BUT New Leaf is all of that and more, so I literally don't see a reason to get this nowadays. Unlike other series like Pokemon which are only superficially similar, this game has absolutely nothing that New Leaf doesn't. I played this a lot back in the day but yeah, I agree that this version is rather hard to recommend these days. What I liked most was being able to visit each other's towns and all that and obviously that's just not possible in this version. If you really want this one, get it on DS, have a friend get it on DS as well, and have a blast together. Or just both get New Leaf on 3DS instead. One of the few DS games I still play regularly. And yet, just because a game releases on a handheld doesn't mean it's exclusively enjoyable as such. Games are games, period. They can be played on handhelds, on consoles.... it doesn't matter. Obviously any game on a handheld has the benefit of portability. That's a given. But that doesn't mean those games can't be enjoyed without it. Look at the GC/Wii version. Same game, no portability, yet they were enjoyed by many on console. This whole argument of "handheld games shouldn't be on consoles" is stupid. Handheld games are still just games. And can be enjoyed on any system. The argument falls even further on its face when you consider this game can already be bought and played directly on a 3DS. Bless this article for not having to succumb to the idiots who are saying this is the best version ever even if it's on WiiU. No. Also it's still not the best version anyway. @TeslaChippie The Wii Animal Crossing: City Folk (2008) was released after the DS's Wild World (2005). And as you said, there is little reason to buy this game outside of nostalgia since a superior version is available on Wii U with City Folk (which doesn't have the display issues) and 3DS. In fact the only argument I can make for Wild World, is that you are not forced to use the Wiimote and you can play it entirely on the Gamepad since the top screen is used for very little. Another 256x192p game stretched out on a giant screen. When are Nintendo going to provide 'high resolution' options for these old DS games? I've seen emulators on other platforms offering this function and DS games actually look decent when rendered at a higher resolution combined with filtering. Nintendo you can stuff your 'keeping faithful to the original' line and stick it were the sun don't shine up Miyamoto's trap. DONKEY KONG 64 has 16:9 widescreen and Dolby surround as standard options in 1999 and you refuse to support them. TOTAL SCUM. @sillygostly The fault lies at the feet of Nintendo CORP. The poor old eShop monkey's just do as they are told. They have no control over what Nintendo says or does. This was the first animal crossing I played, i bought the gamecube version a short time after to see the difference. It was a solid game for the ds. But I have new leaf if I really need to play animal crossing. And the world said, "Why?" And they also said, we get a DS port, and not a GameCube or Wii port? And they also said, we get this and amiibo Festival, but not a real HD Animal Crossing? This game is awesome. Wish NoA would release it here. But they are bafoons. @AlexSora89 Considering the 9th gen handheld and console are going to have a shared OS based on the WiiU. I think Nintendo's logic is that it's actually better for the next gen handheld and console for the WiiU to have as much VC as possible as most of it will be transferrable. Anything on the 3DS VC that isn't on the WiiU will likely have to be redone. Annoyingly this means we'll probably have to wait until we can play Gameboy VC games in the 9th gen. But it does mean both 9th gen handheld and consoles will probably have all the 1st party WiiU GBA and DS titles. Because the DS version exists to make money from while fans of the series wait for the Wii U eshop to get the Wii version, then they'll download the Wii version too. The Wii U doesn't do Gamecube ports on Virtual Console so that's out. I'm still getting it when and if it ever comes out in the States. There's some minor elements in it that aren't in future titles that I miss. I could only hope that the Wii version comes to the virtual console library soon, and that will be a good add for the lack of Animal Crossing on the Wii U. This DS one was a good addition, but if I remembered correctly, the only thing I hated about it, was the fishing...without a rumble feature to feel when the fish caught your line, it made it rather tough to try and catch fish in this game...that was my only downfall, but I really really wish the Wii version would come to the virtual console, and they kept the online functionality in that one. 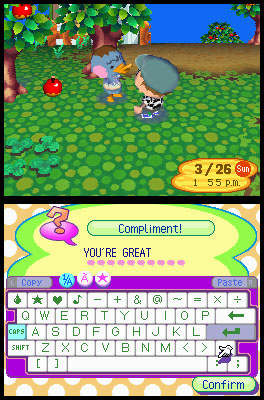 Wild World is honestly my favorite Animal Crossing game. I have very fond memories of opening it on Christmas Eve way back in 2005 and being overjoyed. I still wish Nintendo had the sense to listen to fans and put the GBA and 3DS games on the 3DS eShop. Anybody here remember the Ambassador Program? I still have 10 GBA games on my 3DS, while most 3DS owners have none. Inazuma Eleven for North America is essentially a DS ROM running on the 3DS. The 3DS is more than capable of it, so what gives? Why is this not releasing on VC in North America? I don't understand! When will it? All the good VC games are in UK/EU and Japan. It's getting really annoying. If wifi was enabled for this I would pick it up and play the hell out of it in a heartbeat. This one had much snappier dialogue compared to New Leaf. The villagers were REALLY rude, whereas in later games they would act friendly all the time. Yup. Can't even use local communication. Once you get off that taxi, you're stuck in your town... for life. Come on, a 6? Even disregarding the score, the reasoning for such a harsh review seems feeble. This was one of my absolute favorites on the DS. I might consider some of these releases where multiplayer online and local have been neutered if Nintendo took into account the fact that a big part of the gameplay and fun are missing. If that was a factor when pricing the games, they might get me to bite. I might pay $5 for this, but not $10 (Or to put it in context, the same price as other games where all of the features/gameplay are intact) when a large portion of what makes Animal Crossing fun is the interactions. You are locked in your town. That's not worth the money they are asking. You nerf a game/make no attempt to build a workaround, you don't charge full price (compared to other complete games).